He facilitated many civic organizations including a fire department and a university. From 1785 to 1788 he served as governor of Pennsylvania. 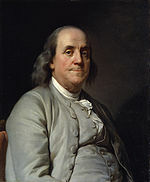 His colorful life and legacy of scientific and political achievement and status as one of America's most influential Founding Fathers have seen Franklin honored on coinage and money; warships; the names of many towns counties educational institutions namesakes and companies; and more than two centuries after his death countless cultural. Franklin always proud of his working class roots became a successful newspaper editor and printer in Philadelphia the leading city in the colonies. He was also partners with William Goddard and Joseph Galloway the three of whom publiBenjamin Franklind the Pennsylvania Chronicle a newspaper that was known for its revolutionary sentiments and criticisms of the British monarchy in the American colonies.